Member of the Month - Meet Shy Spirit! Hot News - The Beaumont is Back! Most chairs have legs and arms, but this chair REALLY has legs and arms!! It’s a simple conversion process that even Dr. Frankenstein would find easy to do. 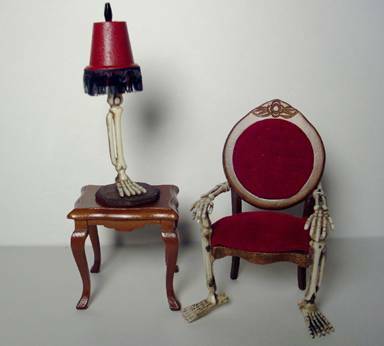 In just a few minutes, you’ll have given an old Victorian chair new life as the perfect Halloween prop. 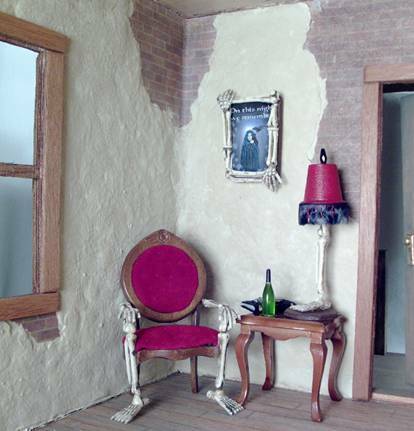 This project is a great way to find a use for an old mini chair. 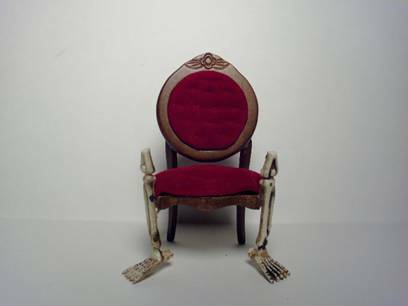 I used a Victorian chair for a gothic look but any style of chair with arms and legs would work. 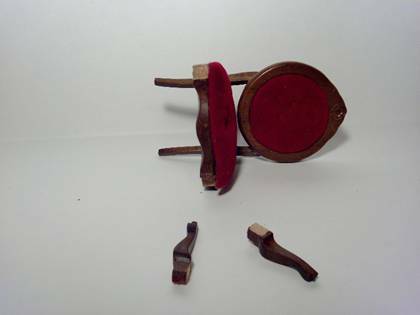 Begin by carefully removing the existing arms and the front legs of the chair. If the glue is a little resistant you can place the chair in the microwave for just a few seconds at a time until the glue softens enough for the legs and arms to be pulled off. NOTE: Be sure to check that there are no metal parts on or in the chair before putting it in the microwave. 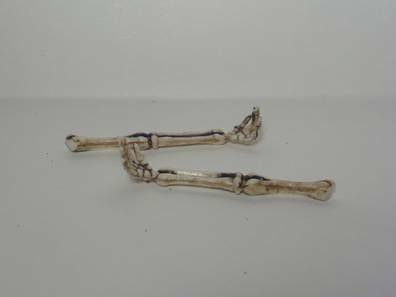 Cut the legs off the skeleton at the hip joint. Measure the length of the back legs of the chair from the seat to the floor and mark this measurement on the skeleton leg so you know where to glue the leg to the seat of the chair. 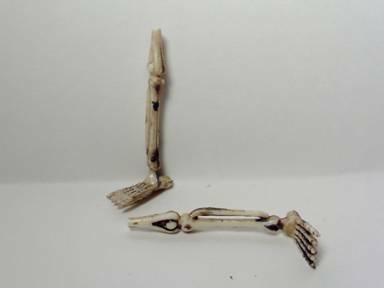 Add just enough additional length to the skeleton leg so that it comes up high enough to be level with the chair arm. Glue the legs in place on the chair, matching the chair seat to the mark you made on the leg so that your chair will sit evenly. 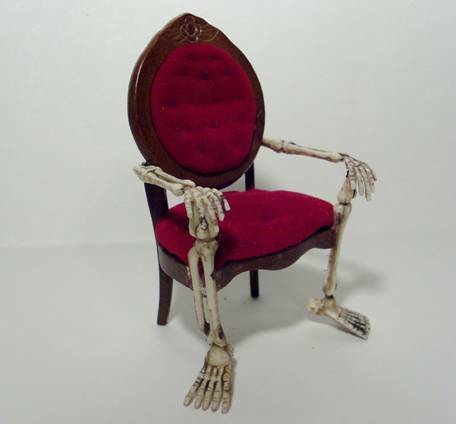 Measure the distance from the back of the chair to the leg and cut the skeleton arms to that length. Bend the hands into fists and hold them for a minute. When you release them, they’ve still have a slight curl to the fingers. 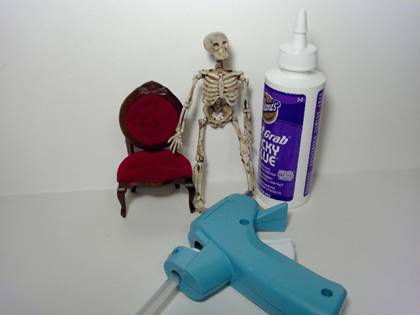 Glue the back joint of the arms to the back of the chair and glue the hands in place on top of the leg bone. 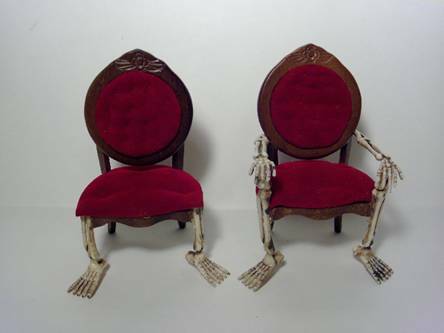 If you would like a really formal look to your Halloween scene, make a second chair, cutting the leg bones shorter and leaving off the arms so you have a lovely Victorian set of a lady’s and a gentlemen’s chair. For the perfect Halloween décor or vignette, add the lamp and picture frame from the first tutorial in this issue of the Gazette!